NETs trapping yeast spores. 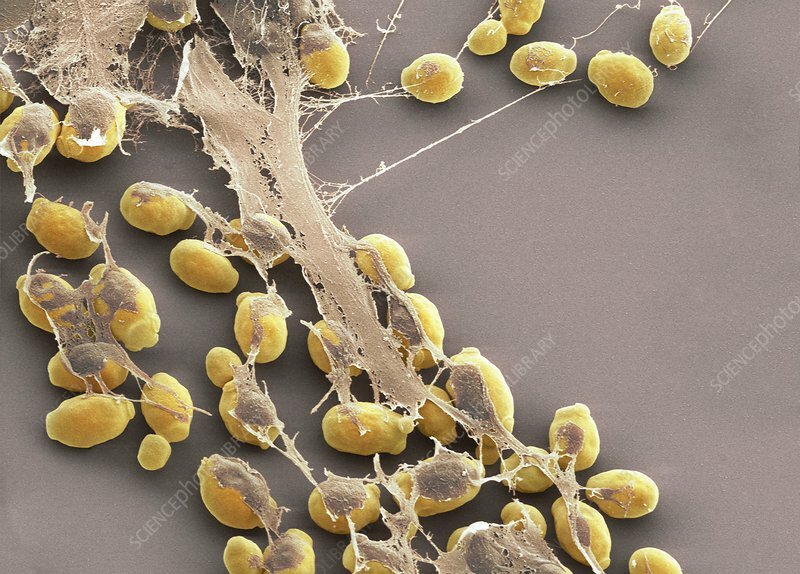 Coloured scanning electron micrograph (SEM) of neutrophil extracellular traps (NETs, brown) capturing spores from the yeast Candida albicans (yellow). NETs are extensions from neutrophils, the most abundant white blood cell in the body. Once the spores are trapped, they are then phagocytosed (engulfed and destroyed) by the neutrophils. Candida albicans is a fungus commonly found on human skin and mucous membranes. However, it can cause infections, such as thrush or nappy rash, in those with weakened immune defences.